What Silver Bullion to Buy? Having decided to invest in silver, you might be wondering how and what to purchase. Silver investments are divided into two broad categories – physical silver and paper silver. Physical silver is silver that is tangible – it is handheld and easy to transport and receive. The most common types of physical silver are bullion bars and coins. Bullion is high purity silver, at 99.9%+, and is commonly available in weights of 1, 10, 100, and 1,000 troy ounces. Both silver bullion bars and coins are popular for collecting and investing. Physical silver can be stored in a house safe, at a bank safety deposit box, or in a depository. Paper silver is called “paper” because the assets are held in paper. You do not physically hold your silver. Instead, you have a piece of paper or certificate that states how much silver you are entitled to. Types of paper silver investments include silver certificates, silver accounts, silver exchange-traded funds, silver mining stocks and silver futures. Certificates are issued by governments stating that you are entitled to receive a specified amount of silver at the time that you choose to redeem your certificate. When your silver is on account, there are three types of accounts it can be stored in. It can either be an allocated account, pool allocated account, or pool unallocated account. In an allocated account, all of the details of the type silver you’re entitled to are listed on the certificate. You receive exactly that amount of silver that has been allocated for you. In a pool allocated account, the silver you are entitled to is lumped together with the silver that other customers are to receive. In an unallocated account, your silver is not allocated for you and the company is allowed to do with it what they want. While you are entitled and can redeem your silver at any time, it is possible that the company may not have the amount you require in trust. Mining stocks are another type of paper silver. With these, you hold stock in a silver mining company. However, your stock does not just depend on the market value of silver. The value of your shares is also determined by the performance of the mining company. So if the company is mining well and the spot price of silver is high, your share will be worth more than the spot price. Exchange traded-funds trade silver on a major stock exchange. This investment is a form of trading, so you have a broker buy or sell silver shares on your behalf. Each share technically entitles you to owning a specific amount of silver – you may never actually see the silver you own, but you do own it. Because these are traded on stock exchanges, they mirror the fluctuating market price of silver. So, if you choose to invest in an exchange-traded fund, you’ll need to be vigilant and monitor the spot price of silver constantly. 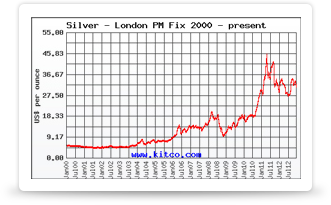 Silver futures trading occurs on major exchanges as well. For silver, most trading occurs on the Commodity Exchange of the New York Mercantile Exchange. Futures involve an agreement between you, the buyer, and a seller to make a trade at a fixed future point in time. Because it involves predicting the value of silver in the future, it involves speculation. It is high risk because the value of silver can fluctuate at any time, so if you’re just looking into starting an investment in silver, you may want to hold off on futures until you’ve become more knowledgeable about the silver market. It can be highly profitable, however, as futures allow you to leverage your available capital into a much larger position. Regardless of which type of silver you choose to invest in, do your research to make sure you fully understand the benefits and risks involved. Good luck!